"Windfall helps Mission Valley Animal Shelter survive"
POLSON — The south side of the old building at the Mission Valley Animal Shelter was sinking, apparently since the cinder block structure was built on a landfill. Cracks in the foundation and instability had the Mission Valley Animal Shelter staff and board checking their shrinking donations and modest budget for a way to pay for building repairs. Then a miracle came in the form of a generous bequest from a MVAS supporter. The bequest was enough to finance a significant portion of the repairs as well as a much-needed 900-foot expansion. An additional $12,000 came through MVAS' partnership with National Relief Charities to cover the repair of the flooring in the sinking building. The total cost of the addition and repairs to the original building was estimated to be between $65,000 and $70,000. Lee Christensen, another MVAS advocate, designed the building. Hu Beaver Builders was chosen as the contractor, and construction began on May 25. "We hope to have it (the addition) open the first part of September," said Sharon Hawke, vice-president and legal counsel for the MVAS board. The shelter has been in continuous operation since 1992, the only animal shelter between Kalispell and Missoula and from Great Falls to Idaho. MVAS is a privately funded shelter, receiving no government funding. The shelter has committed to substantially reduce its euthanasia rates, Hawke said. MVAS only makes a decision to euthanize an animal for serious health or behavior reasons, not for lack of space. Their numbers prove their commitment. Lower than the national average, euthanasia rates in 2007 were 34 percent; in 2008 they were 15 percent; and for 2009 and the first six months of 2010, MVAS' euthanasia rate was one half of one percent. Adoption rates are good too. 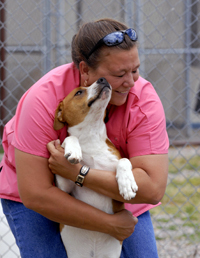 During the first six months of 2010, MVAS took in 125 animals in addition to the ones they already housed. Of that total, 140 animals were adopted, reclaimed by their owners or transferred to other animal shelters or rescue groups. The shelter quit accepting animals in June due to the loud construction noises scaring animals and in order to remove kennels to repair flooring. Hawke said the shelter would begin taking animals again July 23. Due to economic conditions, donations have nose-dived — down 40 percent during 2009 according to MVAS figures. So far, 2010 isn't much better, with supporters giving 34 percent less than in 2009. Seconds 2 Go, a thrift store located next to Steve's Videos and McDonalds in Polson, helps offset the drop in donations. The store's profits all go to the shelter. Though funding is down, MVAS has been receiving more animals. "People just can't afford them," Hawke said. Cats and dogs need to eat, sleep in clean kennels and have social time so MVAS has a wish list. Top item on the list is time. Volunteers are needed at the thrift store particularly. Checks are good, too, as is cat litter, kitten and puppy food and bleach. Visit the shelter online at montanapets.org (just click on Polson/Thompson Falls) on Facebook or come check out the new addition in September.